In a sign of how important alternative places of service have become to the healthcare system, private insurance claim lines for services rendered in urgent care centers grew 1725% from 2007 to 2016—a growth rate more than 7 times that of emergency department (ED) claim lines (229%) in the same period. This finding emerged when we examined alternative places of service in our FH Healthcare Indicators™, 1 of 2 reports unveiled in a recent white paper. (The other was the FH Medical Price Index™, which reports changes in medical prices over 5 years in 6 procedure categories.) Both reports were based on FAIR Health’s database of over $25 billion privately billed healthcare claims—the largest such repository in the country. The claims records are contributed by over 60 payers and administrators who insure or process claims for private insurance plans covering more than 150 million individuals. Along with urgent care centers, we studied retail clinics, telehealth, and ambulatory surgery centers (ASCs)—all settings where people are increasingly seeking healthcare in preference to traditional places of service. The growth of such alternatives does not necessarily come at the cost of traditional settings. Indeed, hospitals and healthcare systems have increasingly been acquiring urgent care centers. This January, for example, the Louisiana-based Ochsner Health System added 2 more units, in downtown New Orleans, to its network of urgent care centers. “Urgent care is more accessible for our patients and has created a relief valve for the entire system and for the emergency room specifically,” Granville Morse, MD, the system chair for Ochsner Urgent Care, told The Times Picayune. Knowledge of trends and patterns related to alternative places of service can be useful not only to healthcare systems but to payers, government officials, policy makers, and other healthcare stakeholders. Our results—on utilization, demographics, geographic characteristics, diagnoses, procedures and costs—bring a new level of clarity to an important part of the changing healthcare landscape. Because they offer convenient hours and do not require an appointment, retail clinics and urgent care centers are often lumped together as “convenient care.” And, it is true that retail clinics, like urgent care centers, have been growing rapidly: From 2011 to 2016, claim lines for retail clinics increased by 847%. But, the 2 places of service are generally regarded as differing in the severity of the conditions they treat. Retail clinics are expected to treat a limited range of minor acute conditions with clear clinical guidelines, such as allergies, ear infections, and sunburn. Urgent care centers, which are usually equipped with their own labs and X-ray machines, can treat more serious acute conditions, including sprains, broken bones, and cuts requiring stitches. We found, however, a degree of overlap between the conditions treated by the 2 places of service. 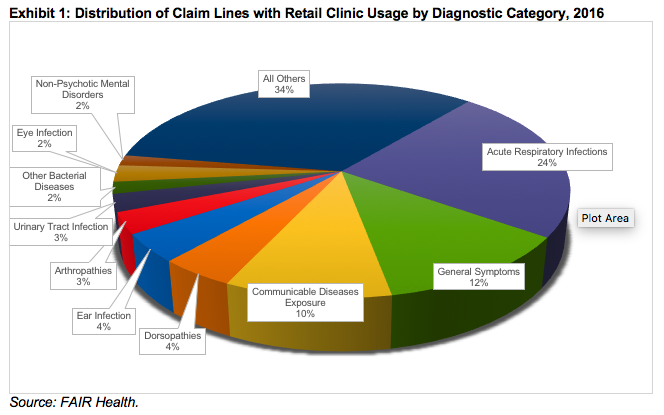 Examining the distribution of claim lines with retail clinic usage in 2016, we discovered that the most common diagnostic category was acute respiratory infections (such as common colds, bronchitis, and sinus infections), which accounted for 24% of claim lines (Exhibit 1). 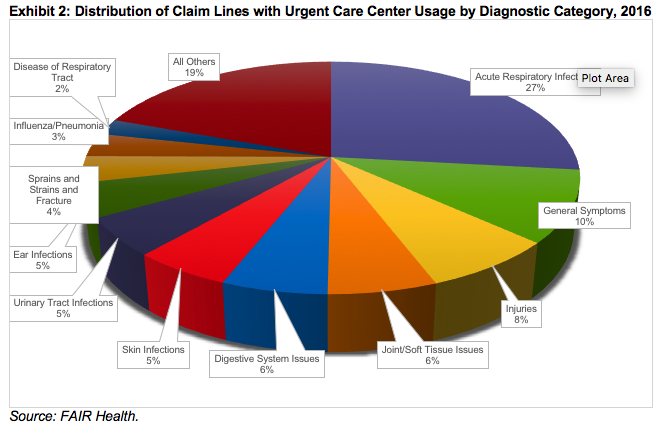 Acute respiratory infections were also the most common diagnostic category at urgent care centers, accounting for 27% of claim lines in that setting in 2016 (Exhibit 2). The second most common diagnostic category—general symptoms, such as fever and malaise—was also the same in both settings, accounting for 12% of retail clinic claim lines and 10% of urgent care center claim lines. It was only beyond those 2 categories that there were marked differences, reflecting the more serious conditions urgent care centers are equipped to treat. At urgent care centers—but not at retail clinics—the most common diagnostic categories included injuries; joint and soft tissue issues; digestive system issues; skin infections; sprains, strains and fractures; influenza/pneumonia; and diseases of the respiratory tract. Another area of difference between retail clinics and urgent care centers was in the age groups using them. 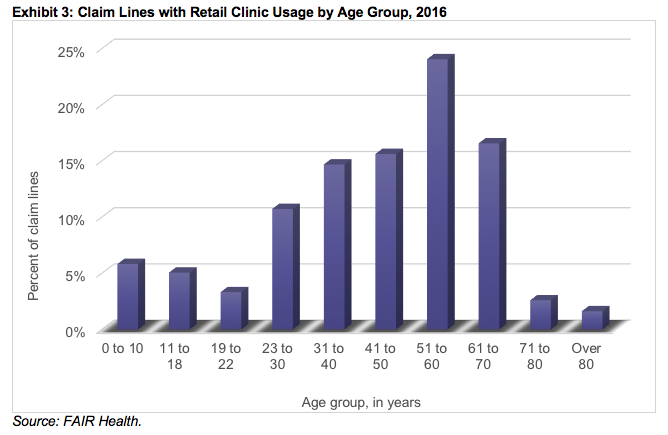 In 2016, the age span of 31 to 70 years accounted for 72% of the claim lines with retail clinic usage (Exhibit 3), but only 53% of the claim lines with urgent care center usage (Exhibit 4). This was in part because urgent care centers had higher pediatric utilization than retail clinics. 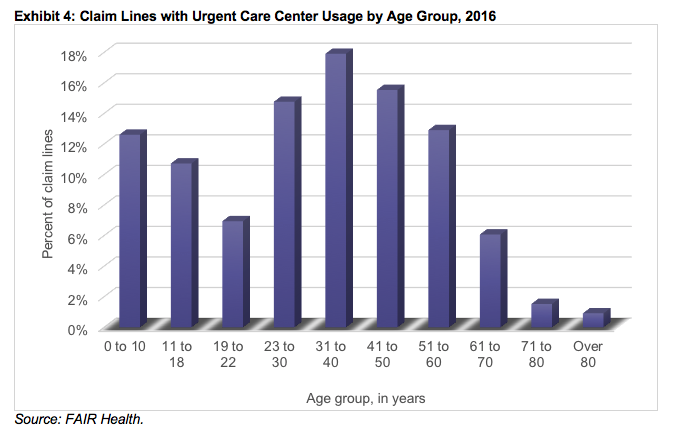 Young people aged 0 to 18 years accounted for 24% of urgent care center claim lines, but only 11% of retail clinic claim lines. In addition, the peak age group skewed younger for urgent care centers (31 to 40-year-olds, at 18%) than for retail clinics (51 to 60-year-olds, at 24%). Retail clinics and urgent care centers differ somewhat in their most common procedures, in keeping with the differences in their most common diagnoses. For example, in 2016, surgery of arteries and veins was one of the most common procedures in urgent care centers, but not in retail clinics. This can make it difficult to compare prices between settings, since a more complex procedure can be expected to be more expensive than a simple one. For a head-on comparison, we analyzed billed charges for the same procedures: new patient evaluation and management (E&M) visits, which typically include a detailed history and examination and medical decision making. The visits are coded by length of time: CPT® 99202 is 20 minutes, CPT 99203 is 30, CPT 99204 is 45 and CPT 99205 is 60. Comparing retail clinics, urgent care centers, and offices in 2016, we found that offices had the highest median charge amounts for every code studied (Exhibit 5). 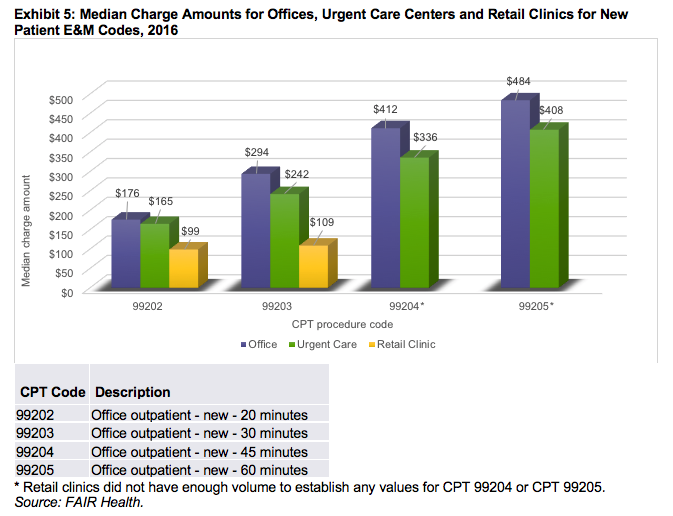 Urgent care centers had higher median charge amounts than retail clinics for 2 codes—99202 and 99203. For the other 2 codes, retail clinics did not have enough volume to establish values. When the same comparisons were made on the basis of median allowed amounts—the estimated amounts insurers negotiate with their network providers—the results were similar except for one code: CPT 99202. For that code, with respect to median allowed amounts, urgent care centers were the most expensive setting. The procedure was reimbursed $111 in an urgent care center, $93 in an office, and $74 in a retail clinic. Claim lines with usage of telehealth—the electronic exchange of medical information between patient and healthcare professional to improve a patient’s clinical condition—grew nationally from 2011 to 2016, but not as much as claim lines with usage of retail clinics. During that period, telehealth claim lines increased 643%, compared with 847% for retail clinic claim lines. When we analyzed growth by rural versus urban areas, however, the results differed. Telehealth claim lines increased 960% in rural areas, compared with only 704% for retail clinic claim lines in rural areas. The difference is probably due to the particular benefit telehealth brings to remote communities with limited access to physicians and hospitals. In urban areas, telehealth claim lines increased 629%, compared with 865% for retail clinic claim lines. Yet, the rural-urban differences may be changing. In 2016, claim lines with urban usage of telehealth outstripped those with rural usage. Telehealth differed from both retail clinics and urgent care centers in its most common diagnostic categories. 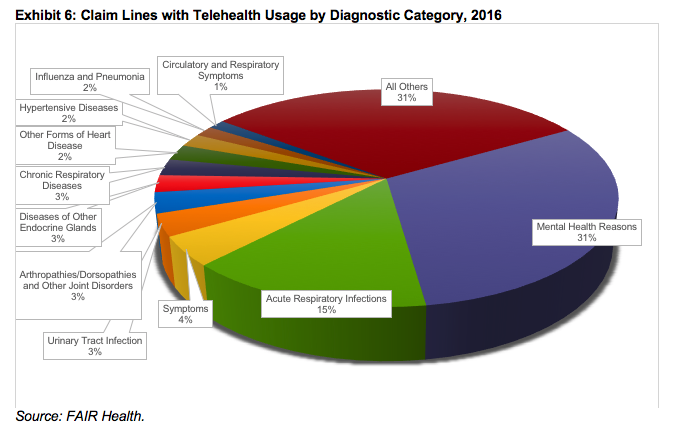 While acute respiratory infections were the most common reason individuals used retail clinics and urgent care centers in 2016, the most common reason for using telehealth that year was mental health issues, which accounted for 31% of telehealth claim lines (Exhibit 6). Acute respiratory infections, at 15%, were the second most common reason for using telehealth. 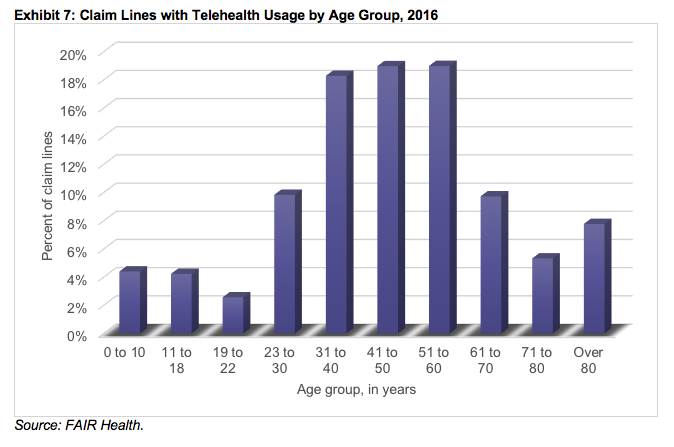 When analyzed by age group, telehealth claim lines (Exhibit 7) were more similar to retail clinic than urgent care center claim lines. In 2016, the age span 31 to 70 years accounted for 66% of the claim lines with telehealth usage—close to the 72% with retail clinic usage. The peak age groups for telehealth were 41 to 50 and 51 to 60 years, each 19%; in retail clinics, the peak age group was 51 to 60 years (24%). The distribution of alternative places of service varies from state to state, partly because of differences in relevant state laws and regulations. In 2016, for example, Massachusetts, which strictly regulates retail clinics, had a low percentage of claim lines with retail clinic usage compared with all the state’s medical claim lines. South Dakota had a low percentage of urgent care center claim lines compared with all its medical claim lines. Yet, both states were among the five states with the greatest number of claim lines with telehealth usage as a percent of all medical claim lines. Utilization of ASCs, which specialize in same-day surgical care, grew in recent years, but more slowly than that of the other alternative places of service we studied. From 2007 to 2016, claim lines with ASC usage increased nationally by 97%. The increase was greater in rural areas (127%) than urban settings (95%). In one respect, ASCs were similar to all the other alternative places of service we studied, as well as to EDs. 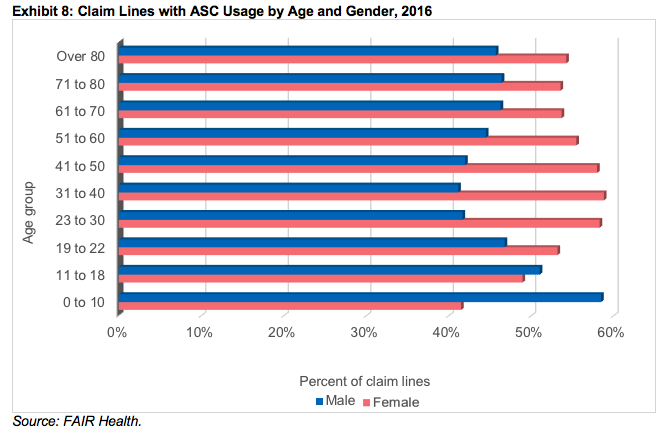 In every adult age group (ages 19 to 80 years and above), more claim lines for ASCs were submitted for females than males (Exhibit 8). Only in the age span 0 to 18 years were more claim lines submitted for males than females. The same was true in EDs. In retail clinics, urgent care centers and telehealth, females predominated in the age group 11 to 18 years as well as all adult age groups. These results were consistent with the findings of other researchers that females are more likely than males to seek healthcare. We hope our research on alternative places of service will prove useful to healthcare stakeholders and encourage further research. These rapidly evolving changes in the healthcare landscape bear watching.